There is no goalie controversy in St. Louis. 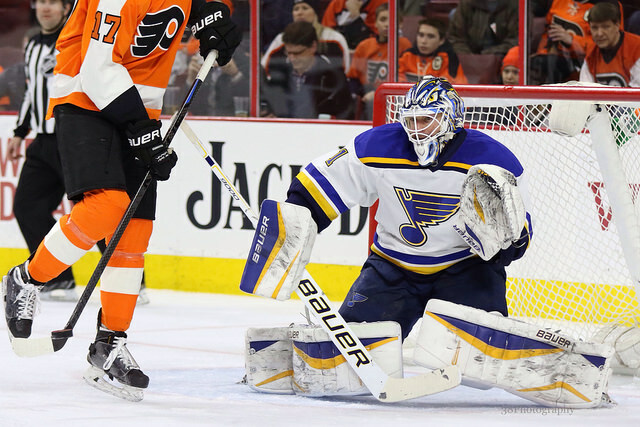 With back-to-back shutout wins in the team’s last two games, the Blues tandem of Jake Allen and Brian Elliott have amassed 42 victories and 9 shutouts this season. Elliott was given the starting job out of training camp and the man know to many as Kid Ells further solidified his hold on the spot with a franchise record 21st shutout for the Blues last night in Calgary. In years past Blues head coach, Ken Hitchcock, has been known to ride the hot hand, usually giving a goaltender pitching a shutout a consecutive start. Makes sense, in a way, but in previous seasons St. Louis has had a more convoluted picture of its starting goalie situation. Allen, who leads all rookies in 2014-15 with 4 shutouts, blanked the Dallas Stars Sunday night but Elliott is this team’s number one and Jake was back on the bench Tuesday night. Elliott missed an entire month of hockey back in December after sustaining a knee injury in a loss to the Ottawa Senators. The Blues hedged their bets on young Allen by signing free-agent goaltender and future Hall of Famer, Martin Brodeur, to a one-year deal. At the time it was uncertain how long Elliott would be out of action and St. Louis has little NHL experience in net behind Allen. The move looked genius but also generated speculation that Ells was out for the season and the Blues would want a veteran presence to take them into the playoffs. The specter of a goalie controversy was alive. You don’t bring in (arguably) the best goaltender in NHL history to ride the pine, and Brodeur ended up splitting the Blues December starts with Allen, eventually going 3-3-0 in seven appearances before Elliott returned from IR. Allen couldn’t take advantage of the situation to dethrone Ells from that number one position, going 3-3-1 himself during that span. Elliott returned and resumed his role as the go-to guy. Brodeur chose to retire and stayed with the Blues in a front office role as an advisor to GM Doug Armstrong. There really never was a goalie controversy and Brodeur’s decision to hang up the skates when Ells was ready to play again only highlighted the fact. After last night’s win, Elliott has started 11 more games than Allen (Marty started 5) and the pair have given the Blues one of the best tandems in the league. Since Elliott’s return Allen has merely gone 7-1-1 with 2 shutouts. And he’s the backup. A role he’s excelling in, much as Elliott did in 2011-12 as he and Jaroslav Halak won the Jennings Trophy.